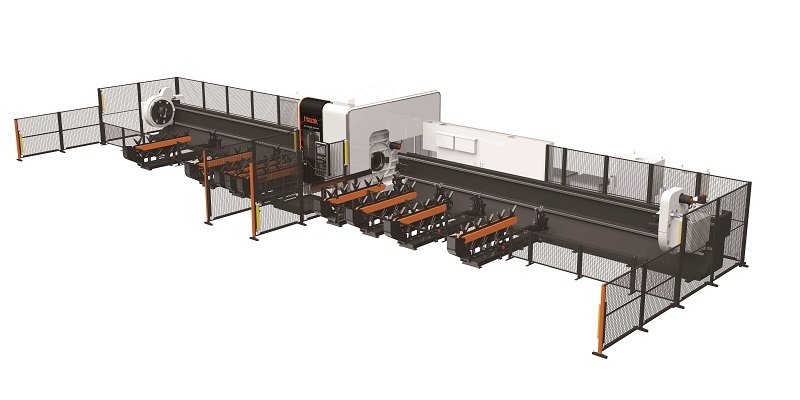 The 3D FABRI GEAR 220 III machine excels for an expanded range of laser-cut tube, pipe and structural applications. Available with a 2.5kW or 4.0kW resonator, the 3D FABRI GEAR 220 III cuts a wide variety of tubes and pipes including round, square, rectangular and triangular. It can also process I and H beams, C-channel, angle iron and additional user-defined shapes from mild or stainless steel. This extensive range of capabilities makes the machine ideal for many industries and applications. Featuring a powerful, high-precision 6-axis laser, the 3D FABRI GEAR 220 III can handle larger, longer, thicker and heavier material than similar machines due to its rigid workpiece handling system incorporating a four chuck design. It also has improved processing speeds, tighter tolerances and can be used for drilling and tapping. The 3D FABRI GEAR 220 III model can process a round pipe diameter of up to 8.6 inches at a rapid traverse rate of 3,937 IPM. For large material jobs, the 3D FABRI GEAR 400 III can process a round pipe diameter of up to a 16”. The 3D FABRI GEAR 220 III cuts a large range of mill-length tube and pipe, whether round, square, rectangular, or triangular. In addition, it can completely process I and H-beams, C-channel, angle iron, and additional user-defined shapes.